South Milton is a small, but very old town of about 400 inhabitants in South Devon. The village has been there for at least 1,000 years and is known for the nearby National Trust beach area of South Milton Sands. I recently visited the area to visited a customer who had discovered a Limestone tiled floor that had been hidden under carpet for around twenty years. 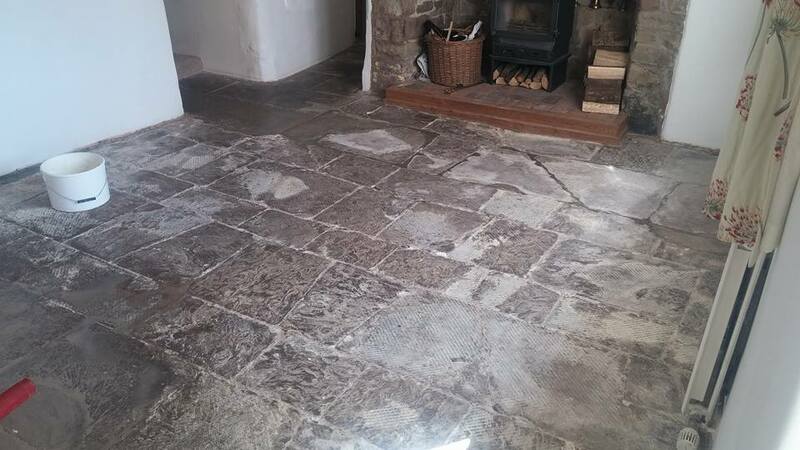 The floor was several centuries old – as is the property itself – and it was suffering from a problem known as flaking or shaling, which is when the top layer of the stone starts to flake off. The customer had already made the decision to remove the carpet and underlay because they wanted to reinstate some character and original features to their dining room! The floor was very dry and dusty and had the imprint of the underlay firmly embedded in some areas. As a result, the floor appeared cracked and damaged (see the photo below) and was in dire need of restoration. A test was conducted using both chemicals and diamond-enhanced abrasive pads to ascertain the most appropriate restoration method; although the diamond pads are the only real option to address the shaling the chemicals could have also been used in the cleaning of the floor. The test showed that the diamond pads were the most effective solution for the floor and a quote was produced which as accepted. With the state the floor was in, I needed to use a process called milling, which involves using Very Coarse diamond encrusted pads fitted to a heavy rotary scrubbing machine to cut back the damaged layer of stone to unveil a fresh surface. The floor was suffering from mild lippage and undulation problems, and the milling would be able to resolve these problems too. Lippage occurs when the surface of the floor becomes uneven and the tiles are not level with one another, and this can be quite hazardous. Undulation is when the floor gets a wave-like appearance. After cutting the floor back with a 50 and 100 grit coarse milling pads to expose the new surface, I gradually smoothed the surface with finer pads up to 400 grit to close the pores in the stone. The floor was then given a thorough rinse which ensured it was clear of all dirt and soil that had been generated, even the imprint from the underlay had been effectively removed. After cleaning the floor was left to dry for two days to ensure it would be fully dry before our return to seal the floor. To seal I used a colour-enhancing sealer called Colour Grow which impregnates into the pores of the stone, lifting the colours and protecting the stone from within. Colour Grow is suitable for use on a variety of natural stone, including Flagstones, Flamed Granite, Limestone, Marble, Quarry Tile, Sandstone, Slate, Travertine as well as Victorian tiles. 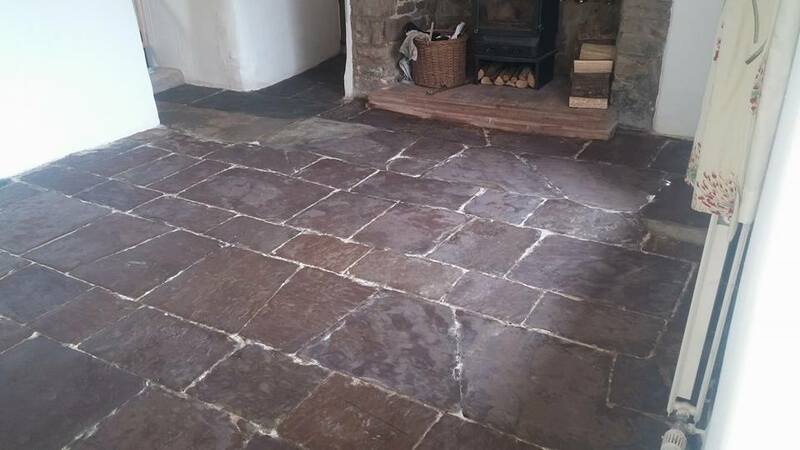 You can see the complete transformation of the Limestone tiled floor in the photo below. The difference made is quite remarkable! The customer had believed the tiles to be unsalvageable, and so she was over the moon with the outcome.